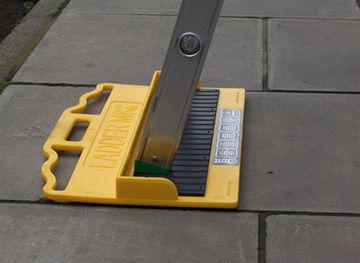 Our Ladder M8rix is a fantastic anti-slip ladder safety device that is placed at the bottom of your ladders, preventing them from slipping on wet surfaces. They are very light weight, easy to carry and are perfect for all workers that frequently use ladders both indoors and outdoors. Made from durable moulded polypropene, the Ladder M8rix consists of a stainless steel plate secured by galvanised tapping screws. The fine metal grips situated on the underside of the Ladder M8rix hold the device in place, therefore preventing slippage on the ground surface.